This post concerning Mas Oyama, Don Buck, and other early pioneers in American Karate, was actually written by Master Instructor BJ. I didn’t know some of this, and there is no way I can compete with the original words presented here. I suggest you do a little googling of the names involved to pad out what you’re about to read. It is well worth it. The original post appeared on KangDukWon.com. BTW, Mas Oyama’s Karate and Masahiko- Gracie JJ Defeater- Kimura Judo workout partners in the Early 1950’s were Tak Kubota and Taiji Kase! In fact the gnarled hand on one of Mas Oyama’s early books- ghost written by Don Draeger- was actually Kubota’s. After WWII Kimura worked as a Pro Wrestler in Europe and N&S America. He hooked Mas Oyama up with some wrestling promoters here in the US and Mexico so Oyama could make some money. Mas Oyama set his US base up in San Francisco where he could continue his training with his Sensei Richard Kim. While not wrestling Oyama lived with Kim’s JJ student Duke Moore and taught/worked out with Duke Moore and Don Buck everyday he was in San Francisco for 4-6 hour workouts. 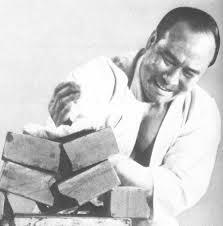 Mas Oyama showing impeccable breaking technique. This entry was posted in american kenpo, Black Belt, Black Belt Course, ed parker, home study martial arts, Kang Duk Won, karate, Martial Arts, real karate, real karate kid, TaeKwonDo, toughening the fist and tagged don draeger, duke moore, kang duk, kang duk won karate, kimura judo, korean karate, kwon bup, mas oyama, norman rha, sensei richard kim on September 21, 2013 by aganzul. This a good article but a few of the facts are not all correct, such as the way Norman Rah met Don Buck and Richard Kim being Mas Oyama’s Sensei. Yes Norman Rah was a student of Don Buck and Don said he was one of the best Kickers he had seen.But he never knocked him down, he did help assist with the classes. But Norman Rah did train under Don Buck and did go to another Dojo later on. 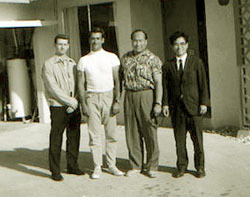 Sosai Mas Oyama, according to all records in 1948 Richard Kim met Mas Oyama and Yamaguchi in Kokohama but did not teach Mas Oyama. Also this information is from someone who was with Don Buck during that time period. Do you know what happened to the school? BTW this blog is fine for commenting, but there is another website I use for KangDukWon comments, it is called Kangdukwon.com. Talk to you over there? I am an old friend of Ron Maletti and have been trying to locate him with no luck. Do you know where Ron is? I am trying to get his email, phone number, or address. No I haven’t seen him in many years but I’ll ask another one of my Dad’s students if he’s heard anything. Do you know of anybody in my area or your area that is teaching the style still? I had heard that there was a dojo which was teaching KangDukWon in the San Jose area however, do not remember his name nor the location of the dojo. If and when I met up with the person who mentioned it to me I will get the name and location and email it to you. Where do you live? Your name sounds familiar to me, don’t know your age you maybe to young for me to have known you. Did you go to Lincoln High school in San Jose? My name is Pat Vasquez, I was actually the one who wrote you the emails. My husband, Johnny Vasquez, has been trying to locate Ron for sometime now when when I happened to stumble on this site I thought I would write an email for him. I noticed that you are Paul Jr, perhaps it was your father that my husband knew. Johnny, was one of Bob Babich’s top black belts, back in the day. Yes I did go to Lincoln High School in San Jose but I do believe you are referring to my father Paul senior. He passed away in December 2011. I never got to ask my Dad this but did Bob ever teach anybody how to use their finger to punch through bored? Hi Paul, I asked Bob specifically about the advanced ‘tricks.’ He had one advice: do the forms. Past that, he said he had no special training. Mainly, he was a VERY intense person, and that intensity, coupled with doing the forms, did the trick. Hi Pat, I heard that Ron passed, but have not been able to find any specifics on this. Hopefully somebody will see this and let us know. Thank you for your reply. I do hope that someone who knew Ron will be able to let us know that he is still alive and well. What about Bob Bob Babich, do you or anyone else know how he is doing? Bob passed a few years ago. I hadn’t seen him in a few years, but students of one of my students had visited him and were quite impressed. I don’t have any details concerning his death, except that i believe it was a simple passing. He was living in his house on top of the Santa Cruz mountains. Perhaps you can check death records and find out more. if you do, please post for the rest of us.